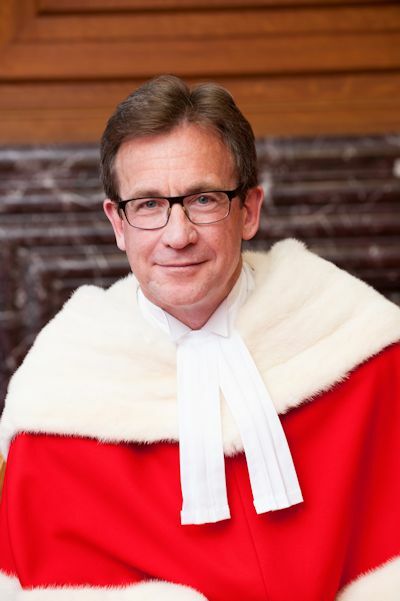 Mr. Justice Clément Gascon was born in Montreal, Quebec in 1960. He is the son of Dr. Bernard Gascon and Denyse Clément. He studied at Collège Jean-de-Brébeuf (D.E.C. 1978) and McGill University (B.C.L. 1981/Upper Second Class Honours and University Scholar). He has been married since 1983 to the Honourable Marie Michelle Lavigne, a judge of the Court of Québec, Civil Division. They have three children. After being called to the Quebec Bar in 1982, he practised law for 21 years at Heenan Blaikie in Montreal, working primarily in civil and commercial litigation and in labour law. He sat on the firm's National Executive Committee and National Management Committee from 1994 to 2002. He was the partner responsible for the litigation department from 1994 to 1999. While working as a lawyer, he also taught business law, labour law and construction law at the Département des sciences comptables of the Université du Québec à Montréal, at the McGill University Faculty of Law and at the Barreau du Québec. In addition, he co-authored a number of books, publications and articles on the individual contract of employment that dealt in particular with termination of employment, restrictive covenants, fiduciary duty and unfair competition. He was appointed to the Quebec Superior Court on October 10, 2002. While on that court, he sat regularly, although not uniquely, as a member of the Commercial Division, and he also acted as the Division's coordinating judge from 2008 to 2011. The Commercial Division hears all commercial law cases, including restructurings under the Companies' Creditors Arrangement Act (CCAA), proceedings under the Bankruptcy and Insolvency Act (BIA) and disputes between shareholders. He also served from 2007 to 2010 as the Superior Court's representative on the committee on class actions of the CBA's Quebec Branch. He assumed the same role on the working group that studied the U.S.-Canada Cross-Border Class Action Protocols. From 2007 to 2012, he co-chaired the Judgment Writing Seminar of the Canadian Institute for the Administration of Justice, where he continues to participate as speaker. He is also a faculty member at the Seminar for New Federally Appointed Judges. He has participated in numerous continuing legal education seminars for judges on commercial law, class actions and judgment writing. He was appointed to the Quebec Court of Appeal on April 5, 2012 and to the Supreme Court of Canada on June 9, 2014. Webcast of the ceremony in honour of the Honourable Clément Gascon, held on October 6, 2014.